I think most of us are familiar with the custom of a family handing down a baptismal gown from generation to generation - a beautiful tradition, indeed. Well, this weekend I encountered another great tradition: handing down a First Communion dress! 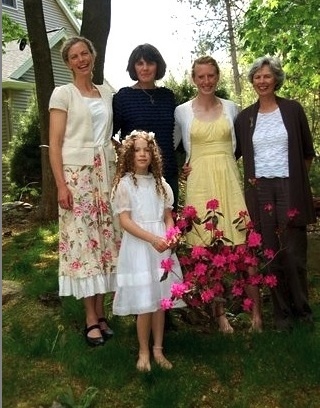 In the photo above, Willa is front and center and wearing her First Communion dress which was also worn by: her grandmother, Claire (far right); her great aunt, Mary Ellen (dark dress); her aunt, Elizabeth (yellow dress) and her mother, Meighan (far left). And by the way: Mary Ellen is Meighan's godmother, Meighan is Elizabeth's godmother and Elizabeth is Willa's godmother! This is a family of traditions! In addition to strengthening family customs and bonds, handing down a First Communion dress might relieve all involved of excessive focus on "the dress" -- not to mention eliminating the cost of such an item. Does anyone else have an experience of such a custom? I love this. What a wonderful tradition....thanks for posting. I love this! I love the tradition, the unbroken chain of the dress being handed down; it is sacramental and puts the focus on something besides the outward show. I love this idea, very thoughtful and resourceful. Resourcefulness is a virtue! Another expensive item is prom gowns. I borrowed one from my friend in high school and nobody was the wiser. I agree. And First Communion always comes so close to Easter (another occasion when money is spent on fancy clothes that don't get worn much) that when my two sons made their First Communion they each wore their Easter suit with a white tie and a white rose in the lapel. They also wrote a note to Project Bread and donated the money that would have been spent on a white suit. And unless they're doing a second grade production of "Mark Twain Tonight" when are you going to wear that again?? Delightful and, as Fran pointed out, a wonderful way to instill a sense of tradition and appreciation thereof. I worry about the loss of knowledge about folk traditions from Catholics with diverse ethnic backgrounds. These traditions are charming, inspiring and occasionally wonderfully goofy. I love tradition and this is a beautiful one. Was only able to use my baptismal dress for our seven children and many of the 22 grandchildren wore it too. Just this morning I had an email from a friend in another state who found her daughter's First Communion veil and, after a bit of "update," is taking it to her granddaughter in yet another state who will wear it for her First Communion in a few days. Beautiful! Thumbs up! I've heard of a few parishes that keep a rack of First Communion dresses for loan each year. For my First Communion I wore a perfectly plain white organdy dress. But over it I wore an old lace dress that my mother had worn for her First Communion. I guess the underneath part of her dress had deteriorated. I loved the dress and I loved the fact that it had been my mother's!